Our business laser checks, laser business forms program can be described in one word -flexible. It's flexibility stands out among others. Laser checks your company or organization may need can be produced whether it's for a standard software program such as Quickbooks®, Peachtree®, Dac Easy® or a specific application. Only the best materials are used, and strict bank processing requirements are followed. You will be delighted with the appearance and superior quality of these business laser checks or business laser forms. Some of the benefits of utilizing our laser checks are: FREE security features and 500 FREE envelopes with every new laser check order of 1,000 or more. Laser checks and laser forms for over 200 programs are available. Click the link "Laser Checks and Forms" in the navigation bar on the left for more detailed information. Call us for help when ordering at (800) 395-3676. **** Special Prices for QuickBooks laser checks 8-1/2 x 11. See Special Offers page! 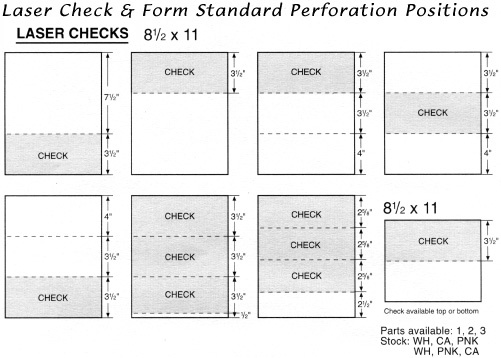 We have laser checks and laser forms available in up to 3 parts (white, canary, pink). Only the 1 part black ink imprint laser check is shown here. Quantities over 10,000 are available. Border: Warning Band with Padlock Icon. Parts: Up to 3 parts (white, canary, pink). Laser Business Forms are available by clicking the link "Laser Checks and Forms" in the navigation bar to the left. There you will find 100's of Laser forms and laser checks for all your business forms requirements. Sizes: 8-1/2" x 11" and 8-1/2" x 7"
Imprint: Black Ink only, heat resistance. Security Features: Up to 11 FREE features. Packaged: Protective wrap in quantities of 250.